TOMORROW: You’ll start off your day with temperatures in the lower fifties. But as you make your way into the afternoon you’ll be happy to see that temperatures will be soaring back into the seventies with beaming amounts of sunshine overhead. Tonight you’ll fall asleep to mostly clear conditions and temperatures will fall back into the comfortable mid-fifties. - Follow WNCT 9 First Alert Weather on Twitter by CLICKING HERE. 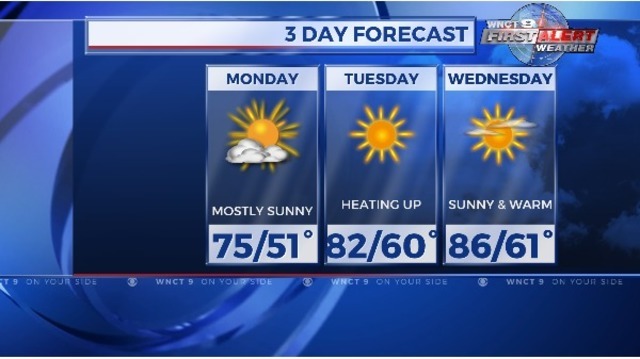 - Connect with WNCT 9 First Alert Weather and join a growing network of friends with WNCT 9 First Alert Weather on Facebook by CLICKING HERE. - Download our WNCT 9 First Alert Weather app, available for free in the Apple App Store and the Google Play store. You can see First Alert VIPIR 9, detailed forecasts, weather maps, and severe weather alerts.